Having recently passed my driving test, all of this was covered. It is part of learning to drive. The issue I think is with peoples general attitudes to one and other, selfishness and lack of any real punishment for minor offences. I remember nearly failing my motorcycling test for describing a solid white line as a “no overtaking” line. The examiner corrected me: it just means you mustn’t stray over the line. On a bike (motor or push) that certainly doesn’t rule out overtaking. Hey, just been pointed in the direction of this. I was the fella who wrote this to the MEN, am a member of Manchester Wheelers, so we have probably met at some HC’s. Annoyingly the MEN edited the letter quite a bit, missing out some important bits. I confess even I at first needed to read up on the solid white line issue – and I work as a traffic engineer. The issues with poor driving are probably linked to firstly that people see the Highway Code as a book to read to pass their test, and not something to be aware of/ever read again beyond that. 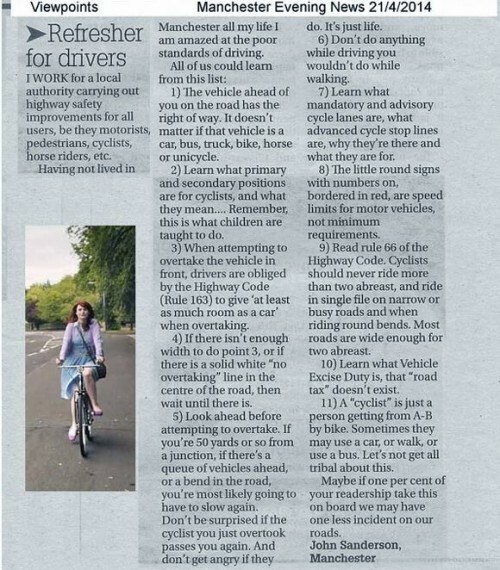 Secondly, when I passed my test 20 years ago there wasn’t much in the HC about cyclists, so most people have never read anything. Third, the HC contains advice and guidance (ie not law) and regulation (law), and it takes almost a lawyers mind to decipher it. On the solid white line, this is what the MEN missed off: You are permitted to cross the solid white line marking to overtake so long as the vehicle in front is travelling at less than 10mph, and that to do so would not be unsafe (typical HC – what is “unsafe?). The inference of this then is that you should slow down, approach the cyclist/horse/whatever, and determine their speed. If they’re <10mph then you are permitted to cross the white line to perform an overtake if safe. This letter went a bit viral for a while on Twitter, even Jeremy Vine from Radio 2 re-tweeted it..! Thanks John for comment and letter.